Not unusually for me, I’m sitting in a dark hotel room, and dawn is just beginning to light the sky, here in the city of the flying vegetable. They did have bar named “Mama Lik It” but I forgot to take a picture of it. And no, I did not misspell “lick” by mistake. That is the way it was on the sign. 😊 Yes, I’m in Pattaya, Thailand again. Taking a break for a few days before the final work sprint in the Philippines prior to returning to Argentina. When I travel, I tend to watch the golf channel on TV. As most of you may know, I don’t play golf. I don’t have a high opinion of the game from a cultural perspective, although I am well aware that it is an extremely challenging. I hesitate to call it a sport, maybe it should be considered a game. The reason I watch golf, in general, is because for the most part it is an extremely calming spectacle. It doesn’t matter what match your watching in one part of the world or the other, it is always a fairly laid-back affair, laden simply with the drivel of the commentators (no different than other sports). And honestly, I can’t tell one match from the other. This morning however, I was watching a “movie” of the 2018 Ryder Cup challenge. For those of you who don’t know, that is where two teams of highly ranked professional golfers, one from Europe, and the other from the U.S., play each other. I was appalled and depressed at the same time. The camera showed thousands of people thronging the course, many egregiously dressed in either American or European union flag regalia. Did they really stand in front of a mirror before they left their abode and say “Wow, I look good.”? Quite apart from the fact that I consider golf to be an environmental offense (simply because it occupies a huge amount of space, takes an inordinate amount of natural resources such as water, and only services an extraordinarily small number of individuals), I found this particular event to be an appalling display of tribalism/nationalism, certainly not at its worst, but a reprehensible display nonetheless. For the love of Christ! Who in their right mind cares whether a team from one country beats a team from another country? How terminally stupid are these people? I am utterly at a loss as to what drives displays like this. Marketing, money, and advertising of course. But I am reasonably sure that most of the “fans” don’t really think about that. I think they genuinely attach importance as to whether the team from their “region” wins or not. Why? What possible importance could an event like this have for anything? I am a minimalist (to some degree), and I consider myself a Stoic philosophically. One of the precepts of being a Stoic is to be in the world, but not of it. At no time do I feel that more than when I am watching sporting events. I do wonder, however, if my viewpoint is overly boring. Would the tapestry of daily life be as rich if we had no sports? I don’t know. Probably not ☹. I have to suppose that competition is not a bad thing. But I object to being triumphant about winning I suppose. And although I would agree that competition in general is healthy, I don’t like the idea that somebody loses. But competition seems to be so much a part of the daily world and it is always referred to as the natural way of things and that it should be good to be triumphant over somebody else. I resent that as a basic assumption. One of the European team players, I think his name was Ian Poulter, after winning some important hole, tried to grimace in an expression of ferocity, pump both arms into the air, and then followed that by macho looking strike to his left pectoral with his fist. I found it somewhat diminished by the fact that his gut was larger than his chest and he looked fairly flaccid and soft. I wonder how fierce he would’ve been in a combat situation. I don’t want the world to be dull and uniform, who would? And competition and sports in general I would, somewhat against my will, have to admit, can be positive influences. But not, I submit, when taken to the insane unthinking excesses that we see in today’s world. Enjoyment of watching skilled physical performances? Absolutely. Caring whether it is your “tribe” that wins? Screw that. Not a very uplifting post I suppose. Apologies. I kind of wanted to get that rant off my chest. I am enjoying my time here, I have been relaxing, stupidly to some degree although I won’t go into details. But no harm done to anybody of course. 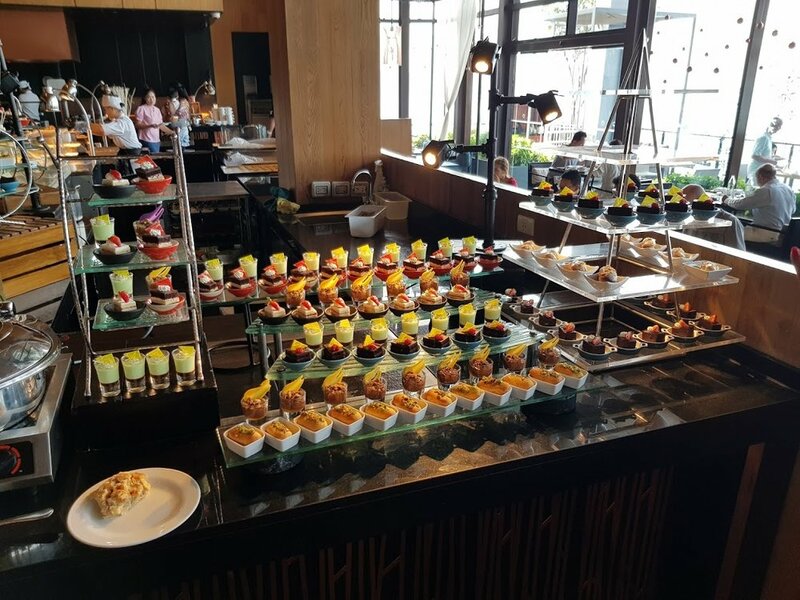 😊 I have also attacked the odd buffet that I wandered past 😊. I’m full of gratitude that I have good friends, the opportunity to be able to come here and relax and enjoy a really good cup of coffee while I’m writing. 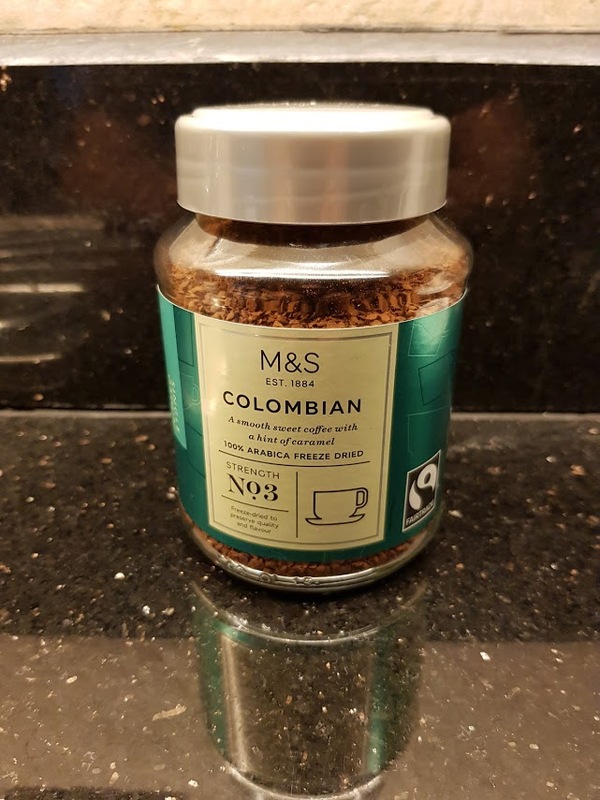 As a completely out of left field note, Marks and Spencer has a food department and I found they have their own brand of instant coffee, Colombian blend, the best instant coffee I have ever tasted in my life. I would put it on a par (See? I can’t get away from golf) with regular brewed coffee. Absolutely amazing. I wish everybody a Happy New Year. Be safe, enjoy yourself with family and friends, and I look forward to talking with you all next year.